Commissioning a piece of custom furniture for your home transforms the space from being purely functional into a unique expression of who you are and how you live. When you embark on creating your space to suit you, your family and your lifestyle, it is often difficult to find a piece that fits the space perfectly, either in colour, style or dimension. Which is why we take the utmost care in understanding you and your needs so that we can bring your ideas to life in exactly the way you envisaged. Our process begins with an in-depth discussion, via phone, email, or in person. 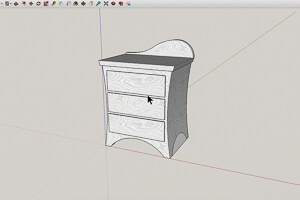 This first step allows us to determine the style, dimensions, materials and finishes. 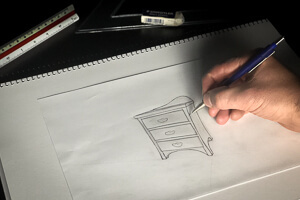 Once we have a clear idea of your vision, we start the furniture design stage, where we offer sketches and 3D renderings to help you visualise your piece. From here, we begin building, which for our furniture makers, is the most exciting part, because we get to see your vision come to life. As passionate woodworkers & cabinet makers, we are more than happy to invite you to visit our workshop in Brookvale to see the journey of your piece to its completion. Custom made furniture gives you the advantage of owning a piece of handmade furniture that suits you and your home, exactly the way you want, because you are unique, and your home should reflect who you are, so why not contact us today for a free quote and let’s begin building your handcrafted piece of bespoke furniture.